On a personal note, do not get discouraged when showing tricolors. We have some tough competition against the brokens. For example, at a triple show, I showed the same tricolor doe 3 times with three different judges. Although competing against all the same rabbits in each show, she placed 7th, 8th and 4th. This just goes to show that each judge sees things differently. The important thing when breeding tricolors is to work toward good body type and fur. It took me a while to understand this, but once I created the "perfect" genetic tricolor (AA BB CC DD ejej), then it was time to start breeding to other varieties which have the type and fur that I need, at the risk of messing up the tricolor gene. This page is designed to help with the understanding of those genetics. Note: Dash marks represent unknown recessive genes. You will notice that all tricolors carry the agouti gene (A), the full color gene (C), and the tricolor gene (ej) in the dominate positions. The B or bb and D or dd genes will decide what color your tricolor is. So let's look at some other varieties. As you will note, the most recessive genes (at the end of each row) have double letters. That simply means they are the most recessive and a dominate gene (the ones listed in front of them) cannot hide behind them. For example, the gene for dilute is "d". Since it's the most recessive gene, only another dilute gene "d" can follow it. A chocolate rabbit (bb) cannot hide the black gene (B). Or a self rabbit (aa) cannot hide agouti (A). So if someone tells you that their chocolate rabbit (self) masks otter, it's impossible. They may have otters in their pedigree, but a self rabbit is "aa" and cannot hide the otter gene behind it. So if you buy their rabbit and think that it can produce otters, it can't. It can, if bred to an otter, as the otter gene can dominate over the self gene. But if you breed it to another self, you will get selfs, not otters. An agouti (A) CAN hide tan (Aat) or the self gene (Aa). And a tan gene (at) CAN hide the self gene (ata). Look at the order of dominance again. See how the "C" gene can hide all the other genes behind it. The chinchilla dark can hide chinchilla light, himalayan and the gene for red-eyed whites. The chinchilla light gene can hide the himalayan and red-eyed whites. But the himalayan gene can only hide the red-eyed white gene. There are three varieties, when breeding tricolors, I would stay away from. The first is anything that carries either of the chinchilla genes. The chinchilla gene, if given a chance to dominate, will turn your red/fawn colors to white (magpie). You really want the full color gene (C). I would not cross a himalayan into tricolors. I'm not sure what would happen, but I know that the colored parts of a himalayan are called points, and that their feet are suppose to be colored. In tricolors, as in brokens, they cannot show color below the ankle joint. I would also stay away from a variety called blue-eyed whites. While they are beautiful, they contain a "vienna gene" that, among other things, may give your tricolors blue eyes and they will not be showable. So taking those varieties out of the equation, let's look at the rest. The agouti gene (A) is important. Tricolors are suppose to be agouti, although I have seen some otter based tricolors and you can't really tell the difference. You can breed out to most agoutis (except those that carry the chinchilla gene). Your genetics will be messed up because of the "E" gene, but at least your offspring should be agoutis that carry tricolor recessively. Selfs (blacks, blues, chocolates, etc.) generally have good body type. If you breed to selfs, you have a lot of work to do to recover the tricolor gene. Selfs carry "aa" and the "E" gene. The only way to get tricolors out of a self to tricolor breeding is if your tricolor is homozygous (AA) and your self carries "Ee". Then the agouti gene can dominate over the self genes and the tricolor gene has a chance of dominating over the little "e" gene. Otherwise you will end up with castors or opals who carry tricolor recessively. Please keep in mind when breeding to a self that your agouti kits will carry self recessively (Aa). If bred to another tricolor who carries "Aa", the recessive "a" genes could match up and give you torted tricolors. Torted tricolors are tricolors who don't carry the agouti gene. Genetically they are selfs (aa) who carry the tricolor gene. Torted tricolors are not showable. 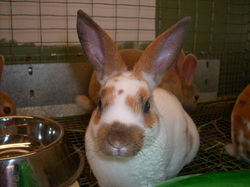 Torted tricolors usually show smudgy coloration and dark ear lacings. 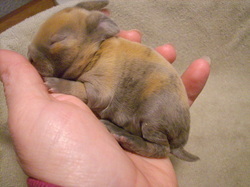 At one to two weeks old you will notice that their ears will have a darker coloration inside, similar to a self kit. Torted harlequins (solids) will show markings similar to a regular tort. Again, wait until your torts develop and watch their body type and fur. If desirable, breed them back to tricolors who carry agouti to correct the torting gene and hopefully retain the fur and type. I have included pictures at the end of this article showing torted tricolors and harlequins. NOTE: Some breeders are now saying that the torting does not come from the self gene, but from the tricolor gene followed by the non-extension gene (eje). Personally, I have not seen this. I have noted that the tricolors may be faded a bit in coloring on their hind quarters, but with the self genes present there is definite torting on the ears and smudgy coloration of the spotting. The "E" gene is important. Most varieties carry the "E" gene. If you breed to any of these varieties, unless they carry "Ee", the "E" gene will dominate over the tricolor gene (ej). So if you take a castor that carries AA BB CC DD EE and breed it to a tricolor who carries AA BB CC DD ejej, your babies will be AA BB CC DD Eej. Look at what dominates - the genotype for castors (A B C D E). So all the kits will be castors, but they will carry tricolor recessively. And the tricolor gene carried recessively is one of the few genes that will "show through". By this, I mean, it will mess up the ring color on your castor kits. It will do the same on any kit that has a ring color in their fur. It will also mess up the belly color on otter kits that carry tricolor recessively. The only time you will not see it is if your kits are solid colors like black, blue, chocolate or lilac (selfs). Now, let's say that your castor rabbit carries AA BB CC DD Ee. Now your tricolor gene has a chance to dominate. It's a small chance (25%), but you could get a tricolor. Your little tricolor would be AA BB CC DD eje, because the tricolor gene can dominate over the non-extension gene (e). But what if your tricolor carries eje instead of ejej? And your castor carries Ee? You could produce a tricolor (eje), but you could also have a chance of those two little "e"s matching up. But what would you get? AA BB CC DD ee - RED! You just produced a red from a castor and a tricolor! 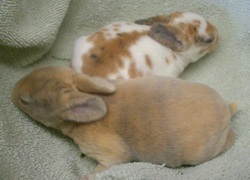 These examples are if both your rabbits are homozygous (carry the same gene in both spots). Most rabbits don't. Most carry some type of recessive gene behind their dominate gene. Your castor could be Aa Bb Cc Dd Ee and still be a castor. Just as your tricolor could be Aat Bb Cc Dd eje and still be a black/orange tricolor. There are another set of genes that determine whether your rabbit is a tricolor (broken), harlequin (solid) or a charlie (double dose of the broken gene). As you can see, a tricolor carries the dominate gene for broken (EN) and the recessive gene for solid (en). A harlequin carries both recessive genes for solid (en and en). And a charlie carries both dominate genes for broken (EN and EN). So if you breed a tricolor to a harlequin, you have a chance of the EN from the tricolor teaming up with the en of the harlequin, which will produce tricolor (ENen). You also have a chance of producing harlequins if the recessive en from the tricolor teams up with the harlequin's en - producing enen. But what happens when you breed a charlie? First of all, a charlie HAS to have parents who are BOTH brokens. Since a charlie is ENEN, it must inherit an EN from both parents. Therefore both parents have to be brokens (ENen), and the two ENs team up. Charlies come in a variety of patterns. They can have complete nose markings (butterfly), 1/2 a nose marking (a spot of color on one side of the nose), or no nose markings. Their ears can be covered with color, or partially covered. Usually they will have only a few spots of color on their body. Most charlies have coloring around their eyes, but it's possible that they won't. Charlies are not showable because the rules say that they must have at least 10% color, and without the coloring on their bodies, they usually don't show 10% color. They say that using charlies decreases the spotting pattern on your tricolors. But I believe that "modifiers" are responsible for how much pattern is produced. I once produced a charlie who was "almost" showable. She came from parents (both brokens) who carried very heavy patterns. She had complete coloration on her ears and around her eyes. The coloring on her body was more than 10%, but she lacked nose markings, making her unshowable. To test and see if you have a charlie, breed it to a solid (harlequin). If the results are all brokens, then you have a true charlie. Remember , charlies are ENEN and harlequins are enen. Since EN is dominate and en is recessive, the end result will be all tricolors (ENen). The charlie doe I mentioned above, which I bred to a solid, produced 6 broken kits. This is the reason I love using charlies. Imagine a whole litter of showable tricolors (pattern-wise). No harlequins or charlies. False charlies are tricolors (brokens) who have little coloration and are usually produced from a tricolor (broken) and a harlequin (solid). They are still tricolors (ENen), but lack the modiifers for a nice pattern. Nice patterns are usually genetic, so if possible, see what the parents and grandparents look like. Remember, tricolors are suppose to have "even distribution of color" so you want to try for tricolors with nearly even amounts of black and orange, chocolate and orange, blue and fawn or lilac and fawn spotting. Most tricolors have more orange or fawn than the darker colors, so breed tricolors with nice patterns or a tricolor to harlequin with nice tricolor patterns in their backgrounds. Some breeders will breed charlies to tricolors. Looking at the genetics (ENEN and ENen), you have a chance of producing charlies (ENEN) or tricolors (ENen). You will not produce harlequins with this match because the charlie does not carry the solid gene (en). OK, you have a tricolor, but can't find another rabbit with the tricolor gene to breed it to. What are your options to produce tricolors? (Check out my page called "Only One Tricolor" for pictures. First of all you want your agouti gene and your tricolor genes to dominate. If you are going for orange coloration (black/orange or chocolate/orange), you could breed to a nice Red (A- B- C- D- ee) or a Tort (aa B- C- D- ee). Just remember that unless your tricolor carries AA and ejej, you could produce something other than tricolors with these combinations. If you're breeding for dilute coloration (blue/fawn or lilac/fawn), I would recommend a lilac fawn. (This is not a lilac/fawn tricolor.) They are usually produced out of two Lynx that carry the non-extension gene recessively (A- bb C- dd Ee). A lilac fawn's genetics are A- bb C- dd ee. A regular fawn has the same genetics as a red (A- B- C- D- ee), but with less rufus. Rufus is the name for the degree of redness. +Rufus has more red, -Rufus has less red (fawn). If you're breeding for dilutes and use a regular fawn, the color genes B and D will dominate and you may get black/fawn tricolors, which are not showable. 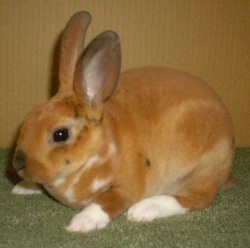 Another option would be to buy a rabbit that the breeder has discovered it carries tricolor recessively. Most breeders of other varieties do not want this gene hiding in their lines and will sell a nicely typed rabbit for cheap. I have purchased 2 black otters where the breeder discovered the tricolor gene was hidden (they produced harlequins when bred to a doe who carried Ee). Again, a rabbit that carries Eej has a chance of throwing tricolors depending on what genetics your tricolor is carrying. But you will also have offspring where the "E" gene dominates. Let's touch for a moment on the influence of recessive genes. Most of the time they will stay hidden unless matched with another hidden recessive gene. For example, I decided I wanted to breed black otters. They are beautiful and I had the opportunity to purchase a black otter doe with nice body type and fur. Since I didn't have a black otter buck to breed her to, I bred her to a nicely typed, nicely furred black buck. She produced a litter of all black otter kits and one red. Red? I knew it couldn't be a true red because reds are agouti. Neither otters or selfs can hide the agouti gene because it dominates over otter and self. I did know that the two recessive "e" genes could produce red. So what was this red colored kit? Since the doe kindled all black otters, I assumed she carried homozygous otter (atat). The otter gene dominates over the self gene so all the kits would be "ata" (otter that carries self recessively). It was now apparent that both parents carried "Ee". If this was true, then my red kit's genetics would be "ata B- C- D- ee". Those are the genetics for a torted otter (or fox). Tort otters are not showable, but she had such a nice body and fur, plus a beautiful reddish/orange coloration that I had to keep her. I eventually bred her to a tricolor buck (the one with the perfect genetics - AA BB CC DD ejej) and since his genes were dominate, she produced tricolors and harlequins. Their pictures are on my page "Only One Tricolor". On the second breeding with this black otter doe I chose another black buck. He had tricolors in his background, but I wasn't sure if he carried it recessively. (Remember you can't see the effects of the recessive tricolor gene on a self.) This time she produced all black otters and a harlequin! Yep, the buck carried tricolor recessively, and it dominated over her little "e" gene. And of the litter of black otters, one had messed up belly color, so that told me he carried the tricolor gene recessively (Eej). The other kits were either EE or Ee. Their belly coloration was correct for a black otter. From looking at this little harle, you cannot tell that she's not an agouti harlequin, but knowing that her mother carried "atat" and her father carried "aa", I know that she's a harlequin otter. Her genetics are ata B- C- D- eje. Needless to say, tricolors are a challenge. Not only do we have to deal with the genetics but the fact that they are shown with the more developed brokens is probably the reason why breeders try tricolors for a while and then give up. And the Standard of Perfection states "even distribution of color" for tricolors. This is not a standard of brokens. They just have to have their color in the right places (around the eyes, on the ears, butterfly on the nose and color on their backs - more than 10% color but less than 50%) to be showable. (Note: brokens/tricolors can have 1/2 a butterfly on their nose, but it's considered a fault.) So we have to work twice as hard to get the body type, fur, color in the right places and even distribution of those colors. Note that the harlequin kit in foreground shows light coloration inside it's ears (agouti) while the tricolor in the background is showing dark coloration inside it's ears (torted). Torted tricolor - smudgy coloration on it's nose and dark ear lacings. Booted, torted tricolor with poor color distribution. Torted black/orange harlequin (1 week). Torted harlequin (6 wks). Coloring runs together. Brindling is not well defined.